It is important to learn how to care for your Ugg Boots before you start wearing them. First, know the circumstances that your boots can handle. Your Uggs are made from sheepskin, which is naturally resistant to small amounts of water, however you should not immerse them in water. If you avoid wading through deep puddles or trekking through mud, your Ugg Boots will last a long time.When not wearing your Ugg Boots, keep them in a dry place, as you would with any shoe. If nothing obstructs the opening of the boots, they will air out on their own. Next time you slip your boots on, they will feel and look as great as ever. One reason Ugg Boots look and feel wonderful is the sheepskin and wool used to make each pair. Wool, of course, is a material that should be cleaned gently. Sheepskin is also delicate, so your Uggs should never be put in a washing machine or a dryer. It never hurts to give Ugg Boots an occasional gentle brushing with a soft cloth or a suede or nubuck brush. This will loosen any dust or small amounts of dirt that might have attached to the boot during the course of the day. Brush your boots in only one direction. Begin by moistening the area with clean, cold water. Then, apply Ugg Australia Cleaner or very gentle soap and Conditioner to a wet sponge. 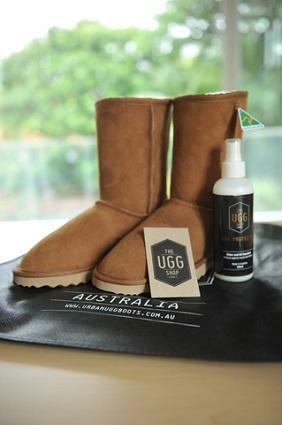 Do not apply the soap or the Ugg Australia Cleaner and Conditioner directly to the boot. Sheepskin can be damaged if soap or other cleaning agents are applied to it without being diluted first. Gently scrub the area. Do not scrub aggressively. Rinse the cleaned area with cold water. Allow the boot to dry naturally and slowly. Again, do not place an Ugg Boot in a dryer and do not use a hair dryer on it. Do not place the drying boot in direct sunlight. Once the boot is dry, lightly brush the cleaned area with a suede or nubuck brush. Brush in one direction only. If you follow these directions, your Ugg Boots will look fantastic for years to come.